Blimey, who’d have thought it! Railroad Bill at their most raucous are a fantastic party band but the variety and depth of new album “Pigs Might Fly” makes it one of the surprising albums of the year! As Britain’s longest running contemporary Skiffle band, Railroad Bill have been a regular fixture at Festivals such as Glastonbury, Goodwood Revival, Cambridge Folk and Bestival for nearly 30 years and are renowned for their humour, DIY attitude, energy and personality. 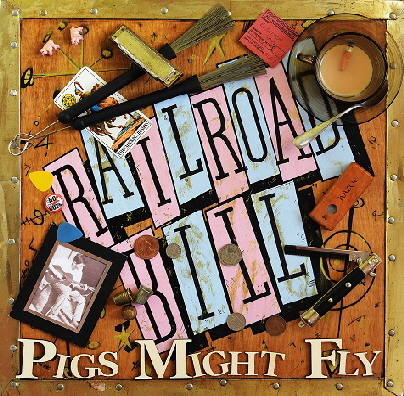 For their latest album "Pigs Might Fly", Railroad Bill have collected a set of original tunes and invited a number of top flight guest artists to help bring them to life with contributions from luminaries such as John Lewis on guitar and Gareth Evans on Trumpet. Tracks vary from the skiffle-punk of "Annabelle" and "Joined at The Hip" to the election-weary tale "Everything's Going To Be Fine" and the Tom Waits-esque "Pain". Those looking for an upbeat folk-pop tune will enjoy "What It’s Worth" with lead vocal by Cardiff teenage soul-pop singing sensation, Kizzy Crawford. All these elements are abundant on their new album “Pigs Might Fly”, a joyous hook-laden compilation of songs which successfully fuses Rock n Roll, Folk, Music Hall, Blues, Country and Calypso styles whilst maintaining the tea chest and washboard based Skiffle sound which they are best known for. Let it be known that Railroad Bill have taken the train into the 21st Century!